the workshop we've all been waiting for: insects! This workshop is aimed at farmers looking for innovative techniques to convert waste into value-added outputs. 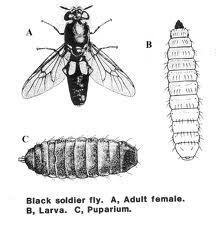 Black soldier fly composting can be an inexpensive way to recycle a wide range of organic wastes into larvae and compost. The larvae can be used directly as a high protein animal feed source or can be refined into feed pellets and biodiesel. The workshop will feature presentations from experts in the field as well as a tour of the Clemson Organic Farm’s black soldier fly operation. By the end of the workshop, you will have all the knowledge that you need to get started growing black soldier fly larvae! For more information, contact Wallace Campbell at campbwa@clemson.edu or 334-313-0113.